Who are the Friends of Rochambeau? 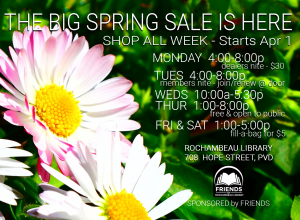 The Friends of Rochambeau want to thank everyone who helped us serve our library and our community last year, as well as to all of you who will lend a hand during the year ahead – when you shop our sales, volunteer for events, donate books or other gifts, you help us promote the library’s mission in a BIG way. Thank You for valuing the library and for ensuring we can meet the information and literacy needs of all in our community! Start or renew a membership with the Friends for just $25 annually – it’s part of how we raise over $13,000 every year for collections, programming, and other expenses at our neighborhood location of PCL. You’ll join hundreds of your neighbors in saying “YES” to the community library! #ROC FRIENDS TOTE BAGS are HERE! Our Brand New Tote Bags Have Arrived @ Rochambeau Friends! 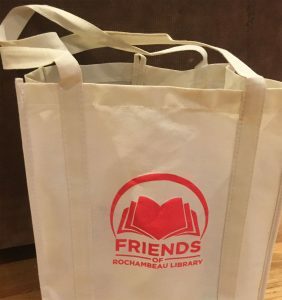 By popular demand from our book sale patrons and library users alike, the Friends of Rochambeau is happy to offer medium-duty, fabric book totes for sale to all! Shopping one of our BIG sales on a “Fill-a-Bag for a Fiver” day? These totes can hold more than a large brown paper grocery bag, and have longer, more durable handles with reinforced stitching down the side! After the sale is over, you will have a very handsome tote for lunches, grocery runs, or picnic blankets, featuring our BRAND NEW #ROC Friends Logo! 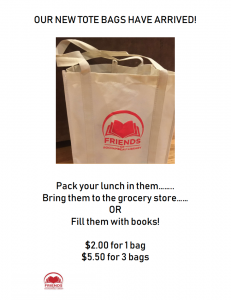 Purchase yours today from the Friends – we have priced them as low as we can at only $2 apiece, or 3 bags for $5.50. Email us for availability or come to our next mini- or pop-up book sale for more info! 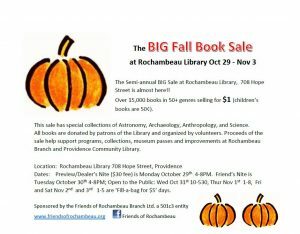 All proceeds go towards supporting our library’s mission in our community. 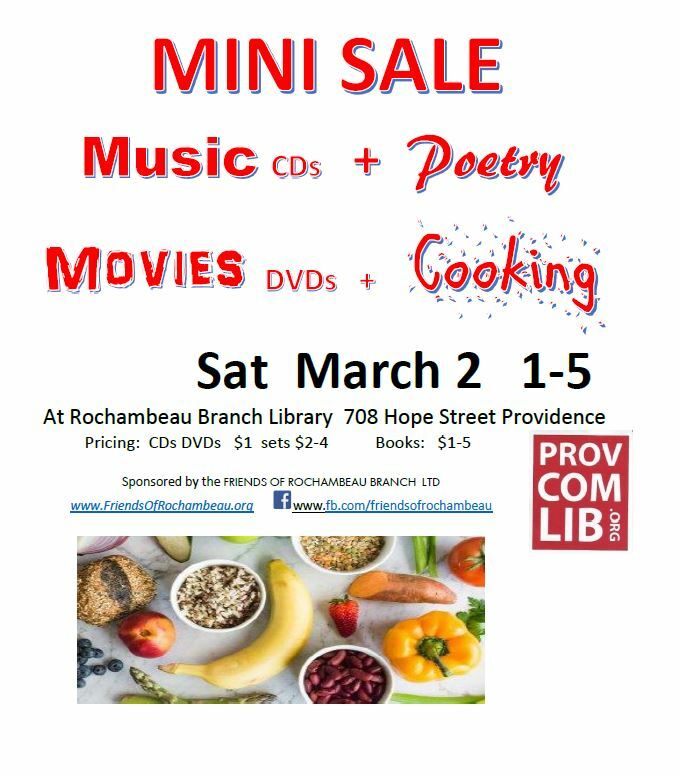 Friends of Rochambeau Library is a 501(c)3 nonprofit supporting our neighborhood location of the PCL system in Providence, RI. Need a receipt for your 2018 gift? Email us today. Who knows who might relish the opportunity to learn a highly employable and very cool skill set FOR FREE – and right in our neighborhood! PCL’s Digital Services Manager, Stephanie Shea has more to say at this blog post. Dr. Michael Fine will be presenting a book talk on his latest, Health Care Revolt: How to Organize, Build a Health Care System, and Resuscitate Democracy—All at the Same Time, on Thursday, October 4th at 7pm. Look for the Zero Waste Providence Reusable Bag Swap bin at Rochambeau Library. It is part of a pilot project through Zero Waste Providence to encourage Providence residents to use reusable bags. Thank You! to our HipHop Arts Education Sponsors! This programming is also funded in part by a grant from the Rhode Island State Council on the Arts, through an appropriation by the Rhode Island General Assembly, a grant from the National Endowment for the Arts and private funders. 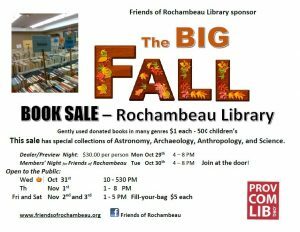 Friends of Rochambeau Library invite all of our members to share this youth arts ed opportunity with anyone in your network. 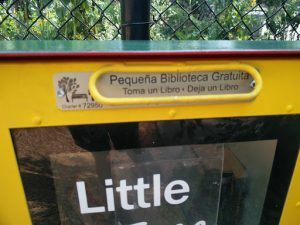 Friends Sponsor 3 Little Free Libraries in PVD Parks! 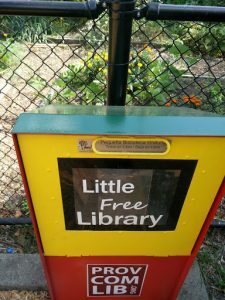 The Friends of Rochambeau worked with Providence Parks Department and Partnership for Providence Parks to install three new Little Free Libraries! Here are two…. Registration Plates Make Them Official! 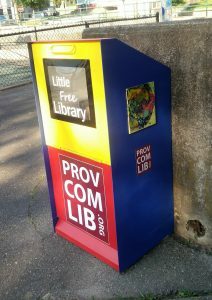 Little Free Libraries are great ways to share literacy and a love of reading with all the people in our service areas. Friends occasionally bring titles to the boxes, but the neighborhoods surrounding them have already started to share and share alike! Stop by your nearest box today! 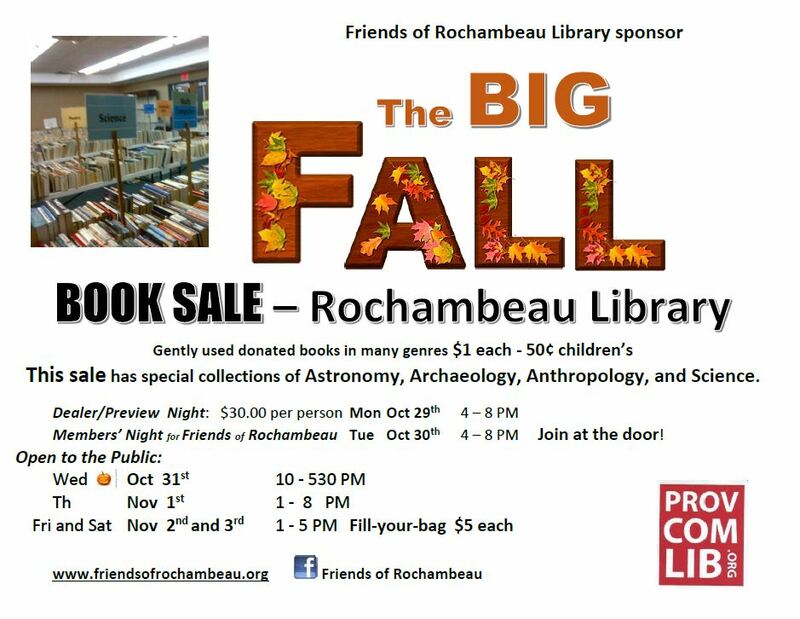 1-2 PM on Friday is reserved for Members of Friends of Rochambeau Library Ltd. Join at the door !! browse our amazing selection of vinyl, CDs and LPs! Pricing: CDs DVDs LPs $1-2 Some vinyl priced higher. or sign up for our e-newsletter to stay in contact. Join Us! for our Annual Meeting on the 1st Monday in June! 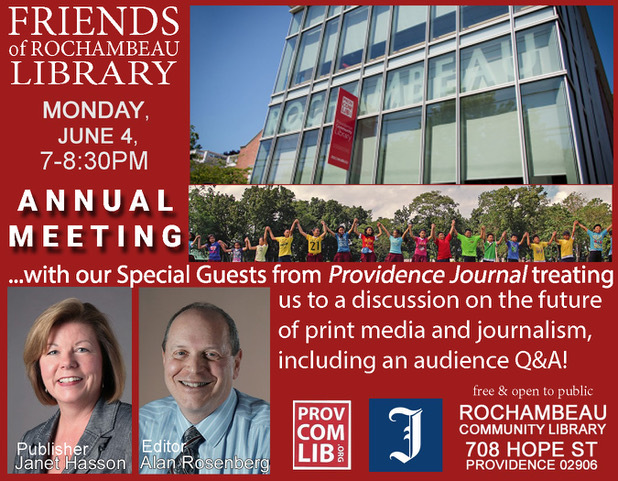 Janet Hasson, President and Publisher, and Alan Rosenberg, Executive Editor, two of the top people at the Providence Journal will be the featured speakers at the Annual Meeting of the Friends on June 4. They will share their experience and insights and answer questions about topics such the viability of the Providence Journal and other print media, the influence of Facebook and social media news sources, fake news, the challenge of fair and balanced coverage, the fate of investigative journalism, and more! Starting at 7 pm, we will have a brief annual business meeting to introduce and vote on the slate of officers and Board members, introduce nominees and review the budget for FY18-19. Ms. Hasson and Mr. Rosenberg will speak after the business meeting. Please come and join us for an informative and lively discussion. Janet Hasson is Regional VP for Gatehouse Media and in 2015 was appointed President and Publisher of The Providence Journal (the oldest continuously-published daily newspaper in the US.) She oversees a portfolio of media products and services that serve the Rhode Island market. Before joining the Providence Journal she was Publisher and President for Journal News Media in White Plains, NY, and has over 30 years of publishing experience. She has worked in various roles driving growth and digital transformation on brands that include The Spokesman-Review, the Cincinnati Enquirer, The Idaho Statesman, the Rochester Democrat and Chronicle, and the Detroit Free Press. A graduate of Eastern Washington University and the American Press Institute’s Executive Development Program, Janet is a four-time winner of the Gannett President’s Ring award. She is a current board member of the Greater Providence Chamber of Commerce, the Providence Foundation, Go Red for Women Executive Leadership Team, the Providence Performance Arts Center, the Greater Providence YMCA, the Providence Public Library, Sophia Academy and member of the Rhode Island Commodores. Alan Rosenberg – Executive Editor has been a reporter and editor at The Providence Journal for 40 years, and since May of 2017 has been the Executive Editor of the Journal and providencejournal.com. A graduate of Northwestern University’s Medill School of Journalism, he has served as Providence police reporter and City Hall reporter, and as part of teams that covered both attempted-murder trials of Claus von Bulow. For several years, he and his wife, Avis Gunther-Rosenberg, reviewed restaurants for the Journal, and he still writes a monthly audiobooks column. He has run suburban offices in West Bay and South County, and a team that covered breaking police, fire and disaster news. On the lighter side, he was editor of the Journal’s former Sunday magazine, and its former LifeBeat, Arts, Live this Weekend and Sunday Brunch sections- though not all at the same time. 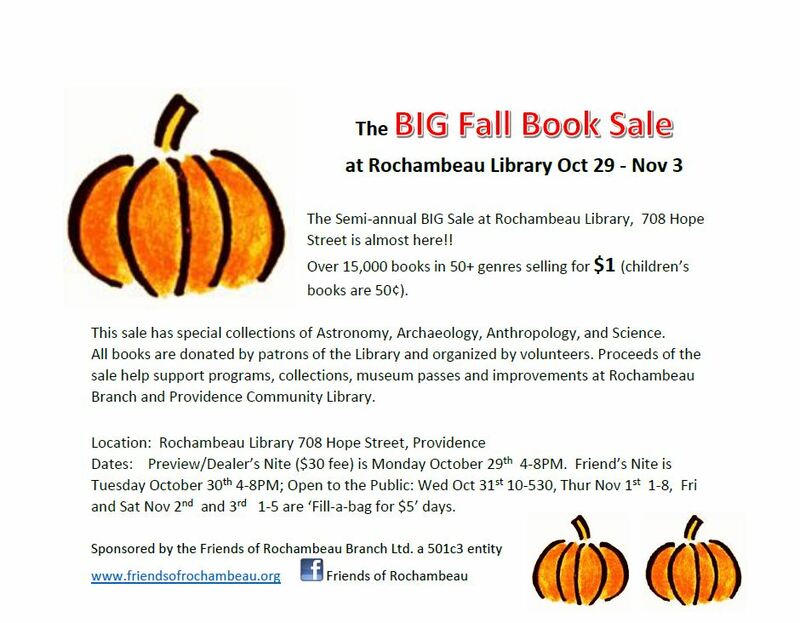 The Friends of Rochambeau is a 501(c)3 nonprofit organization supporting the work of our library in our community. Why not become a Friend today? See the “Join the Friends” link just below our masthead at the top of this page! 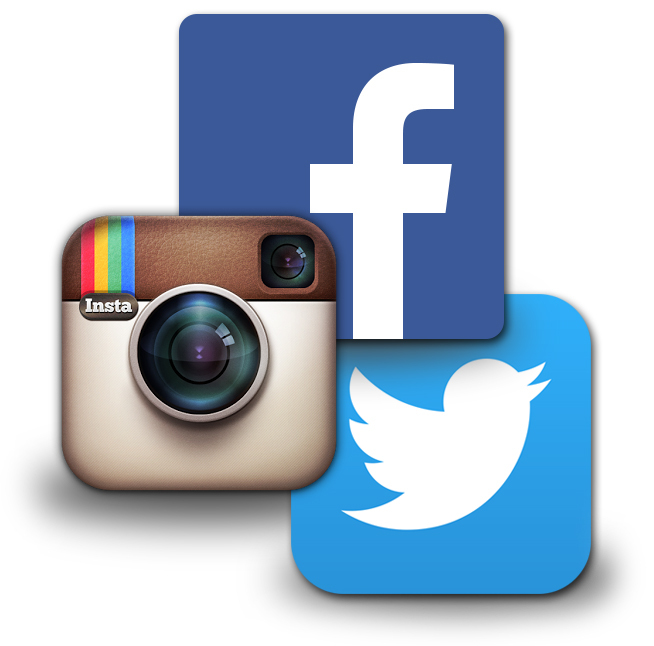 You can also find us on Social Media or sign up for our e-newsletter to stay in contact.